The La-Pha-Pack WebSeal™ system presents a new range of well plates which meet the requirements of today’s chromatographer using well plate compat-ible autosamplers. It provides all of the advantages of sample handling using plates, the security of achieving reliable results along with decades of experi-ence from the market leader in sample containers for chromatography. 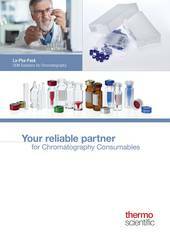 The first complete and chromatography tested portfolio of well plates for separations science applications. Prepare and analyze samples in less time with less lab bench space and storage space required per sample. Easier and quicker filling and sealing process using multi-channel pipetting tools. Efficient transport of many samples in a single plate. SBS/ANSI standard footprint assures compatibility with all well plate capable prep stations and chromatography autosamplers.